10 km North of Orange on N7. 11 km South of Bollènevia the D26. Located midway between Bollène end Orange, in the north of the departement, Mornas spreads out at the foot of an abrupt rocky outcrop 137 meters high. 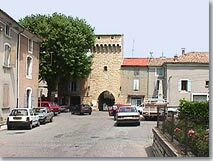 At each end of the village are two magnificent fortified and crenelated gateways which proudly guard the entrance to the village through the ramparts. Longer than it is wide the village seems to be squashed at the foot of the rocky ridge, from the top of which it's fortress still guards over the River Rhône. This small village has preserved some of its historic past. On the steep path which climbs up to the fortress you pass by the XIIe century chapel which is the historic parish church. The unique church porch is said to have been inspired by the Roman theater at Orange. There are a number of active local groups which work to preserve the village and the "les Amis de Mornas" welcome visitors to the fortress, offering guided tours and historical reconstructions. With their words and costumes of the period, find yourself transported back to the the times of the Court of the Comte de Toulouse, the noble who built the castle in the XII° century. 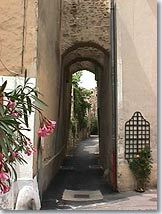 You can also hear how Rimbaut de Vacqueyras in times gone by sang in the provencal language. 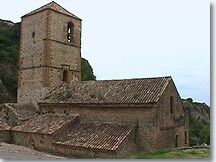 The cultural programme in true medieval tradition accompanies the restoration of the site which the groups have undertaken since 1977. Mornas could have been an extremely calm, tranquil village but it has managed to collect, the motorway, the busy N7 road and railway lines...!! !...However thanks to the enormous efforts made to conserve its cultural and historic heritage Mornas has managed to surmount these problems and welcomes an increasing number of visitors each year. Ste Baudile Chapel (remains), ramparts. Val Romigier Church (XI° and XII°). 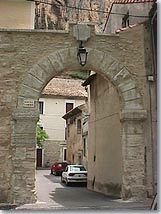 St Nicolas and St Pierre Gateways. Mornas Medieval fortress guided tours. 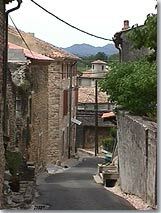 Piolenc (4 km), Mondragon (5 km), Uchaux (9 km), Sérignan du Comtat (10 km.